Here's a crafty gift idea book - how many of us wish we could personally make gifts for friends and family? Too often we have to spend time getting to the store, searching around for the perfect gift, and getting home again. 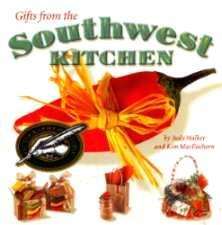 Judy Walker and Kim MacEachern have put together a collection of great gifts to make, with a southwestern flair. They give you the necessities you'll need to get (if you get some of the bits and pieces each time you're out shopping, and in sales, so much the better) like baskets, bottles and jars, ribbons and beads, pens and brushes, and more. You don't have to spend a fortune either. Now you can find uses for so many wonderful items you always see and wish you could use. Handmade gift items are usually much more appreciated because they convey the message that you care. You don't have to be the naturally creative type either - most people can follow instructions - practice and you'll soon develop your own personal style. Who knows, you might accidentally stumble upon an item that will sell and make you a small fortune! Their ideas include soups mixes, condiments, salsas, breads, desserts, and preserves. I'd forgotten how nice it would be to receive some homemade lemon curd, or a marmalade. Where necessary, the recipes have been supplied and they've also added some label ideas. Conclusion - An interesting and inspiring book - you'll be able to put together a gift in no time.